Qigong’s main purpose is to cultivate the life force energy within you, to optimize health and well-being. Practicing these simple movements increases your vitality, enhances immunity, builds stamina, develops mental acuity and revitalizes sexuality. Qigong has been shown to improve posture and respiration, induce the relaxation response, cause favorable changes in blood chemistry, and improve self-awareness and concentration. 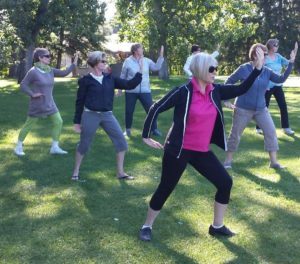 Research suggests that Qigong may be beneficial for Asthma, Arthritis, Cancer, Cardiovascular Disease, Chronic Fatigue, Fibromyalgia, Headaches, Pain, and a wide variety of common ailments. External Qi Healing is effective for the same range of illnesses as acupuncture. Qigong for the most part is a simple practice. It does not require any specific belief system nor does it embrace any religious ideology. It is however one of the most powerful systems of healing you can do for yourself.